The following information was supplied by the Framingham Police. Where arrests or charges are mentioned, it does not indicate a conviction. July 10, 2017: 5 arrests and 6 crashes. 12:22 a.m. Civil matter reported at Margarita’s restaurant at 725 Cochituate Road. Framingham Police advised. 12:25 a.m. 2-car crash reported at High and Main streets. No injuries reported. 12:56 a.m. Missing person located at 1 Frederick Abbott Way at Wayside. 1:05 a.m. Loud music reported at 2 Mechanic Street. Unfounded. 1:39 a.m. Reported noise complaint at 43 Claflin Street. Framingham Police advised. 2:01 a.m. Reported fire transport from 43 Claflin Street. 2:33 a.m. Suspicious motor vehicle reported at CVS Pharmacy on 492 Concord Street. Motor vehicle removed. 2:46 a.m. Reported attempt to locate at Dragon Lair, 82 Concord Street. Framingham Police unable to locate. 4:53 a.m. Reported motor vehicle break-in at 132 Union Avenue. 5:46 a.m. Reported medical case at 49 Edmands Road Apartment 134, Shillman House. 6:04 a.m. Car versus deer accident reported at Worcester Road/ Southboro town line. 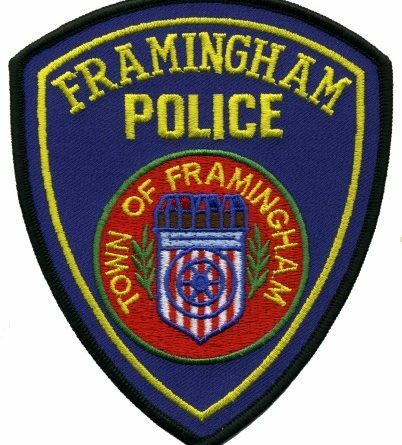 Framingham Police contacted by Southboro police. No injuries reported. 6:24 a.m. Reported hit and run accident at 1622 Worcester Road Apartments parking lot. 8:04 a.m. Reported breaking and entering at Gentle Place Yoga Studio, 79 Main Street, Suite 101. 8:22 a.m. Reported hazard at Worcester Road/ Southboro town line. 8:30 a.m. Reported medical call at 49 Edmands Road, Apartment 326, Shillman House. 8:33 a.m. Reported prisoner transport to MetroWest Medical Center, 115 Lincoln Street. Framingham Police transported. 9:14 a.m. Reported breaking and entering at Braydon Michael Salon, 79 Main Street, Suite 103. 9:25 a.m. Reported transport from Framingham District Court, 600 Concord Street. 9:41 a.m. Suspicious activity reported at 5 Foster Drive. Framingham Police advised. 9:49 a.m. Medical call reported outside 11 Weybossott Avenue. Framingham Police assisted. 9:55 a.m. Animal complaint reported at Anzio Road/ Concord Street. 10:07 a.m. Car crash at 7 Perry Henderson Drive. Babineau caller reported that his granddaughter hit a parked vehicle. AAA towing arrived at the scene. 10:46 a.m. Reported breaking and entering at Anderson Cycle, 61 Tripp Street. 10:48 a.m. Larceny reported at 776 Franklin Street. 11:04 a.m. Suspicious Activity reported at the Basic Apartments, 154 Union Avenue. 11:45 Reported disturbed person at MetroWest Medical Center, 115 Lincoln Street. Framingham Police assisted. 11:53 a.m. Reported suspicious motor vehicle at MetroWest Medical Center, 115 Lincoln Street. Check OK.
12:25 p.m. Hazard reported at Arlington Street/ Irving Street. 12:30 p.m. Animal complaint at Chickatawbut Road. 12:58 p.m Reported medical call from Marshalls, 1 Worcester Road. 1:07 Suspicious activity reported at 9 Bethany Road, Apartment 105. 1:15 p.m. Medical call at Framingham District Court, 600 Concord Street. Framingham Police assisted. 1:29 p.m. Reported lost/stolen property at the station at 1 William Welch Way. 1:43 p.m. Hit and run reported at Concord Street/ Howard Street. 2:02 p.m. Framingham Police responded to a medical call at Charles River Medical, 571 Union Avenue. 2:34 p.m. Framingham Police responded to a medical call at 11 Weybosset Avenue. 2:43 p.m. Reported 2-car accident Taralli Terrace/ Waverley Street. No injuries reported. 2:51 p.m. Reported well-being check at 35 Danforth Court, Unit 2. 2:56 p.m. Police responded to a 911 call from SMOC Child Care. The call was a dialing error. 3:17 p.m. Reported motor vehicle crash at the school bus yards, 185 Fountain Street. No injuries reported. 3:43 p.m. Reported case of identity fraud at CVS Pharmacy on Worcester Road. 4:33 p.m. 2-car crash at Digital Federal Credit Union, 60 Worcester Road. No injuries reported in the lot. 4:41 p.m. Reported case of identity fraud at 79 Main Street. 5:01 p.m. Framingham Police arrested Alexander Rivas at 7A Winthrop Street. Rivas on charges of larceny over $250. 5:01 p.m. Reported case of Larceny at Atlantis Auto City, 128 Waverley Street. 5:04 p.m. Reported medical call from Bose Corporate Center, 100 The Mountain Road. 6:32 p.m. Reported attempt to locate at MetroWest Medical Center, 115 Lincoln Street. Located. 6:41 p.m. Reported lost/stolen property at Lifetime Athletic, 490 Old Connecticut Path. 6:57 pm. Suspicious motor vehicle reported at Sheraton Hotel. Framingham Police advised. 7:00 p.m. Suspicious activity reported at Econolodge, 1186 Worcester Road. 7:11 p.m. Car crash reported at 79 A Taralli Terrace. A parked car was struck by a neighbor who drove off. 7:20 p.m. Framingham Police arrested Angel Morales, identified as a homeless man. Charged with operating a motor vehicle a second time after his license was suspended. 7:28 p.m. Framingham Police arrested Paula McNulty-Roman at 26 Raleigh Road on a warrant. 7:47 p.m. Reported civil matter at Maplewood Condominiums, Apartment 301, 27 Gordon Street. Framingham Police assisted. 7:50 p.m. Framingham Police responded to a medical call at Apartment 12 at Century Estates, 7 Weld Street. Police assisted. 7:51 p.m. Reported suspicious motor vehicle at 5 Beaver Park Road. 8:00 p.m. Police made an arrest at 50 Dinsmore Avenue in the rear parking lot of the Bayberry Apartments for drug possession with intent to distribute class E. Name not in log. 8:17 p.m. Fire department transport one individual from Jack’s Abbey, 100 Clinton Street. 9:21 p.m. Property reported lost/stolen at Lifetime Athletic, 490 Old Connecticut Path. 9:21 p.m. Reported case of larceny at Normandy Arms Apartment 4, 15 Second Street. 9:29 p.m. Property reported lost/stolen at AMC Theatre, 22 Flutie Pass. 10:22 p.m. Reported noise complaint at 11 Wilde Avenue. Framingham Police advised. 10:38 p.m. Motor vehicle reported stolen at Sofa Cafe, 181 Concord Street. 10:40 p.m. Suspicious activity reported at 157 Grant Street. Check OK.
10:49 p.m. Reported fire transport from 1 William Welch Way station. 11:02 p.m. Suspicious motor vehicle reported at Bose Park Place, 1 New York Avenue. Vehicle removed. 11:08 p.m. Reported disturbed person at 37 A Second Street. 11:20 p.m. Framingham Police arrested Bradford Davis at 5 Weld Street for outside warrants.